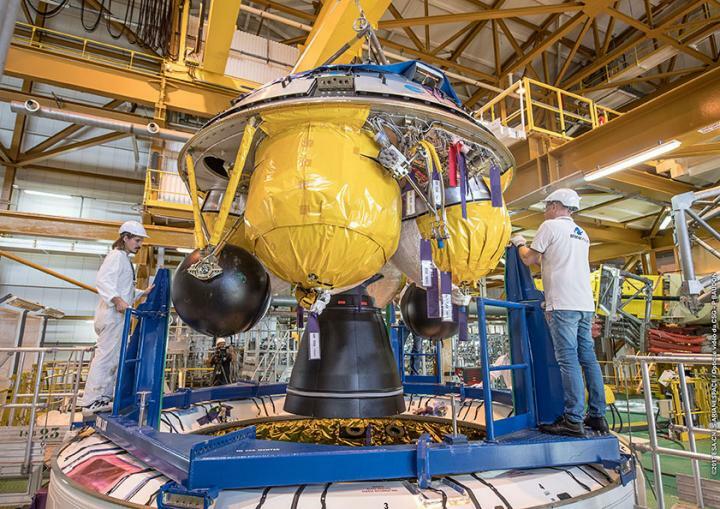 These components arrived this month in French Guiana aboard the MN Colibri, which is one of two sea-going roll-on/roll-off ships that transport launcher hardware from Europe to the South American launch site for Arianespace’s family of launch vehicles. 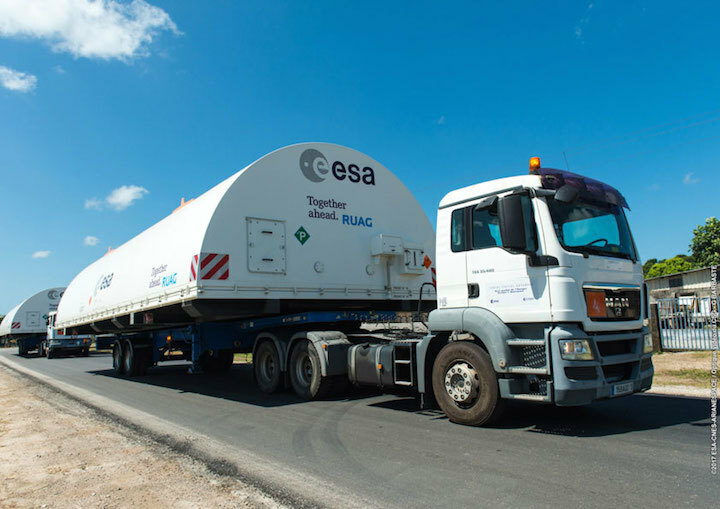 The two half-shells for Ariane 5’s payload fairing enter the Spaceport aboard separate flatbed trucks. 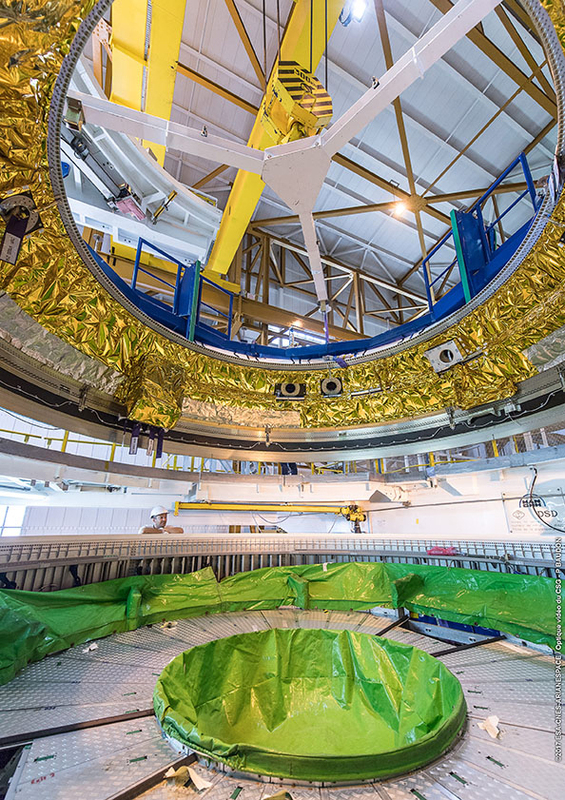 When assembled on Ariane 5, the fairing will protect Flight VA240’s Galileo satellites during the launcher’s ascent through the atmosphere’s denser layers. 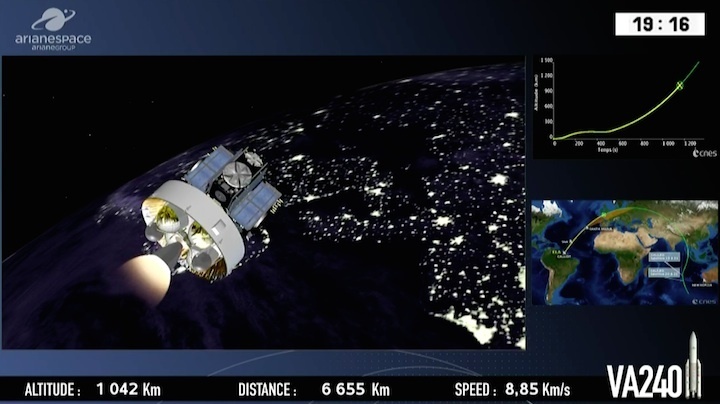 Payload processing for Arianespace’s second Ariane 5 mission in support of Europe’s Galileo global navigation system has reached full speed, with all four satellites now at the Spaceport. 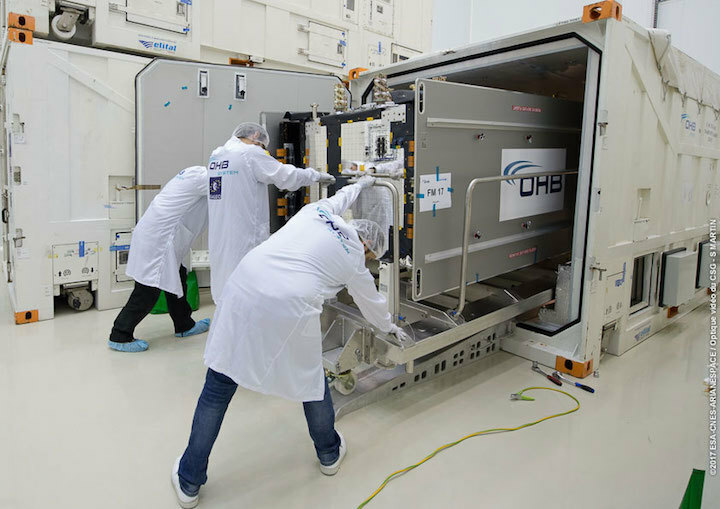 One of the latest-delivered Galileo satellites is removed from its protective shipping container inside the Spaceport’s S1A payload preparation facility. 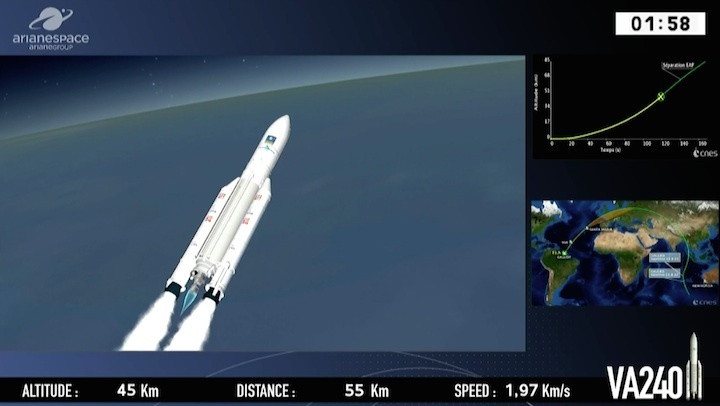 Liftoff of Arianespace’s Ariane 5 with these satellites is targeted for December 12, coming after the heavy-lift workhorse’s previous flight at the service of Galileo, which successfully delivered four other spacecraft to medium-Earth circular orbit in November 2016. 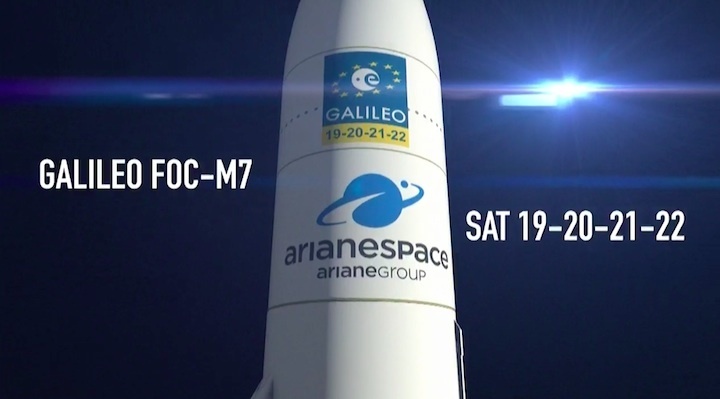 The upcoming mission is designated Flight VA240 in Arianespace’s launcher family numbering system, denoting the 240th performed with an Ariane-series vehicle from the Spaceport. It also will be the company’s 11th and final launch in 2017, closing out a busy year of space lift activity. 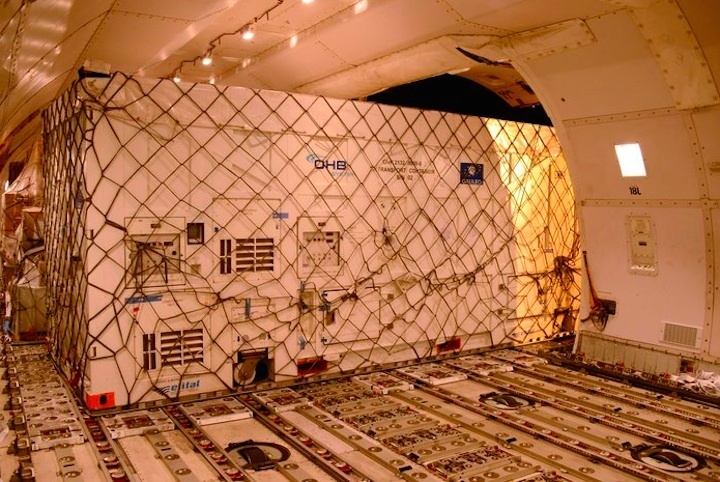 As the latest mission carrying Galileo satellites, Flight VA240 is to be conducted on behalf of the European Commission under a contract with the European Space Agency (ESA). Galileo is funded by the European Union, with overall responsibility for management and implementation held by the European Commission. 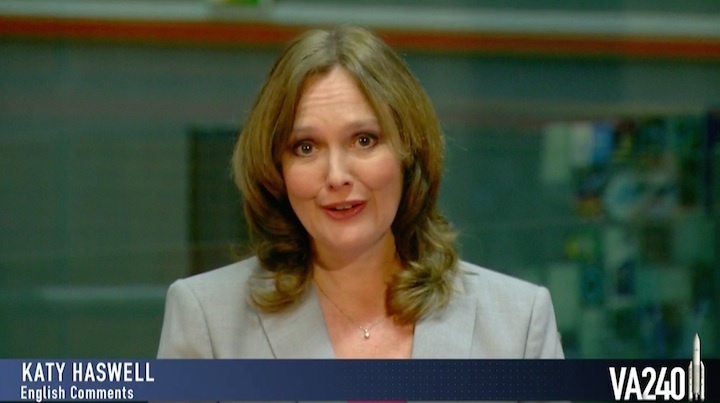 ESA is assigned design and development of the new generation of systems and infrastructure. 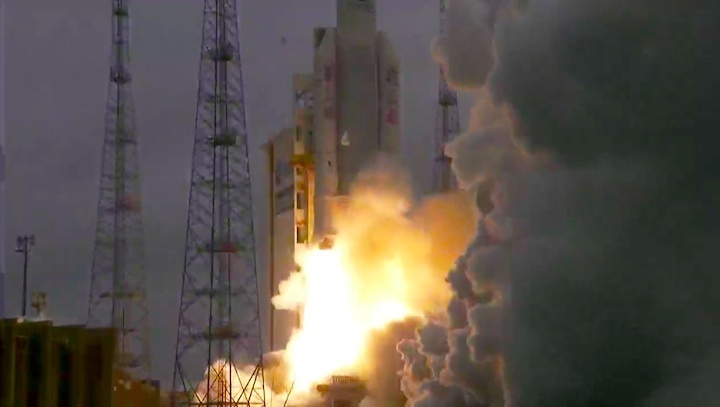 Arianespace already has launched a total of 18 Galileo spacecraft, including the four orbited by Ariane 5 in November 2016, plus the others lofted by seven preceding medium-lift Soyuz vehicles that carried two satellites each. Inside the Spaceport’s Launcher Integration Building, Ariane 5’s vehicle equipment bay is lowered atop the core cryogenic stage on Flight VA240’s Ariane 5 ES launcher version (left and center photos). This cleared the way for installation of the launch vehicle’s EPS storable propellant upper stage (at right). 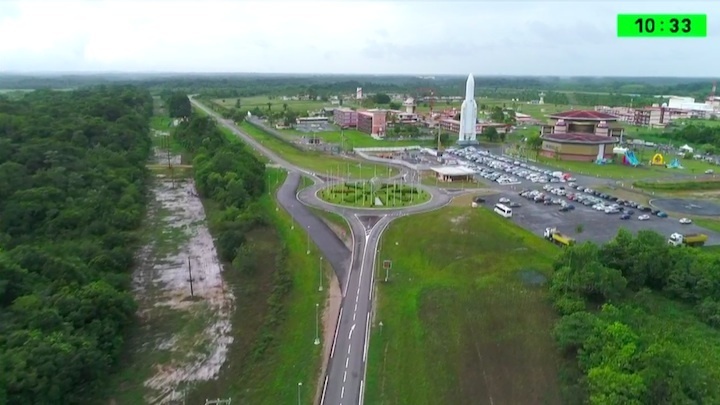 The Ariane 5 for Arianespace’s December 12 year-ending flight for 2017 has completed its initial build-up at the Spaceport in French Guiana – where preparations also are moving ahead with four satellite passengers that will further expand Europe’s Galileo global navigation system once in their final orbit. 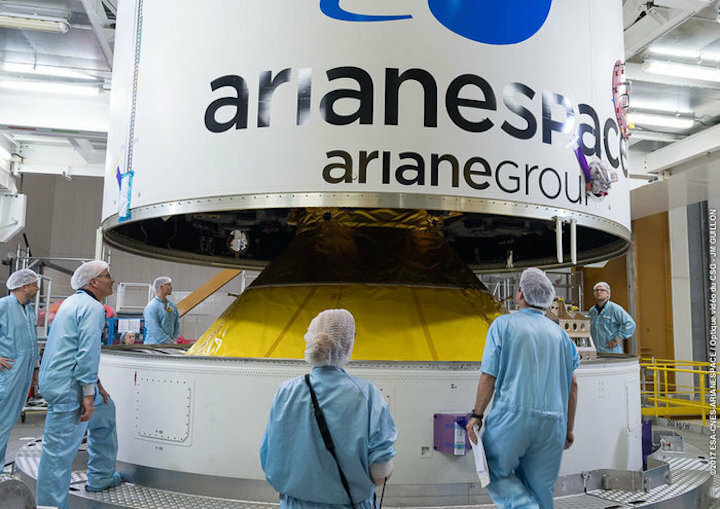 During activity in the Spaceport’s Launcher Integration Building, this heavy-lift vehicle for Arianespace Flight VA240 underwent the assembly process that began by mating its two solid propellant strap-on boosters with the main cryogenic stage. 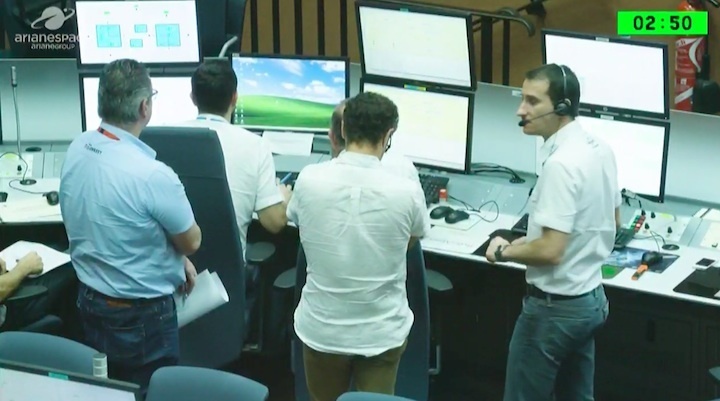 The next step was integration of Ariane 5’s vehicle equipment bay, which serves as the launch vehicle’s “brain,” providing autonomous control during the various mission phases. 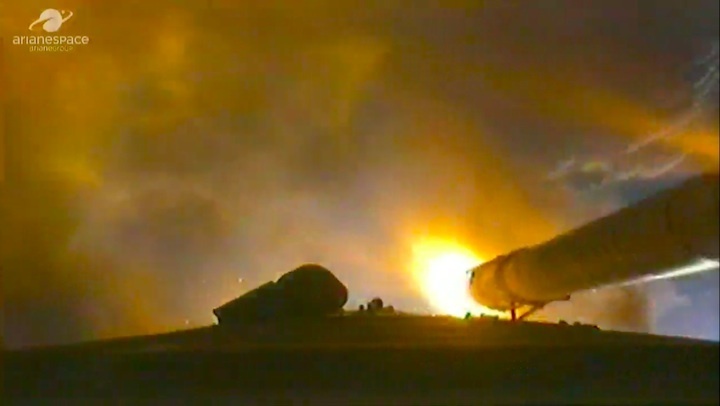 It was followed by installation of the EPS storable propellant stage, powered by a re-ignitable engine that operates with MMH and N2O4 propellants. 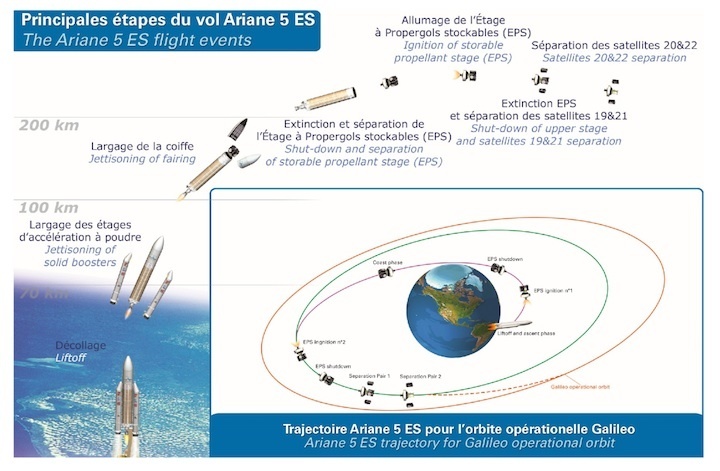 This differentiates the Ariane 5 ES configuration from Arianespace’s Ariane 5 ECA version – which has a cryogenic upper stage and typically is used on Arianespace missions with telecommunications satellites to geostationary transfer orbits. 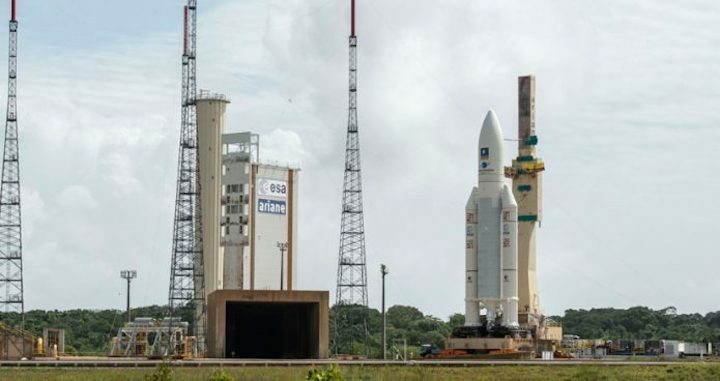 After completion of verifications and systems checkout by production prime contractor ArianeGroup, the Ariane 5 ES launch vehicle will be moved to the Spaceport’s Final Assembly Building for payload integration and readiness for rollout to the launch zone. 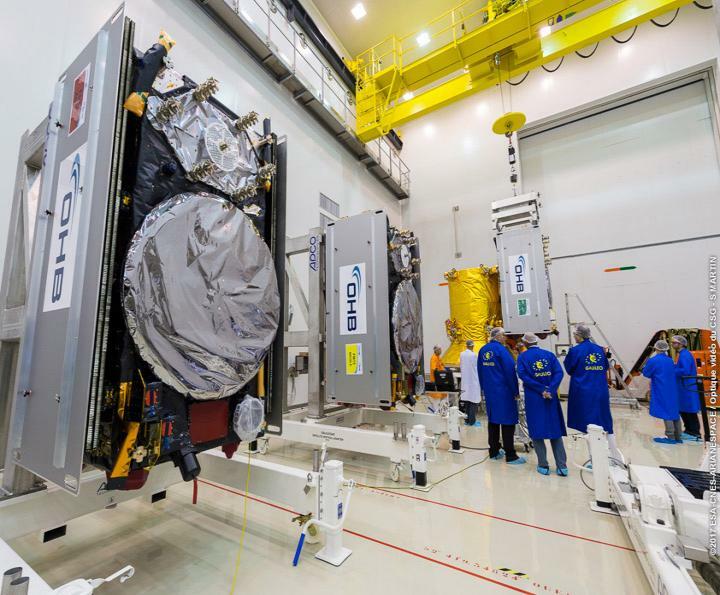 The mission’s ongoing payload preparations – which so far included the checkout and fit-check procedure for each of the four Galileo satellites – took place inside the Spaceport’s S1A processing facility. This involved a one-by-one verification of the spacecraft’s interface with the payload dispenser that will release them into circular orbit during the mission. After the fit-check procedure in the S1A facility, the four satellites were readied for transfer to the S3B payload preparation center for fueling. For Ariane 5’s December 12 mission, the heavy-lift vehicle will carry its quartet of Galileo satellites (weighing approximately 715 kg. each) and their dispenser system for a medium-Earth orbit deployment. Galileo is the European initiative to develop a global satellite navigation system. Under civilian control, it will offer a guaranteed, high-precision positioning service. As a European Union-funded program, the Galileo constellation will comprise 24 operational satellites, along with spares. Overall responsibility for Galileo’s management and implementation is held by the European Commission, with the European Space Agency assigned design and development of the new generation of systems and infrastructure. Ariane 5’s mission with the four Galileo spacecraft will close out a busy year of launch activity for Arianespace, which has performed 10 missions from French Guiana so far in 2017 – all of which were successful. 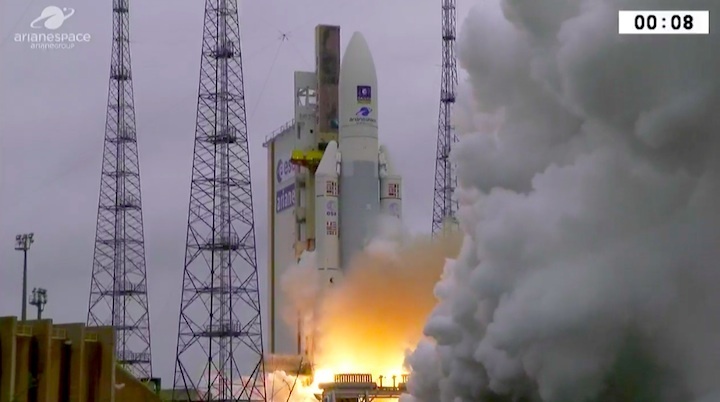 The flights to date involved five launches of the heavy-lift Ariane 5, two with the medium Soyuz and three with the lightweight Vega. In the Spaceport’s S1A clean room facility, three of the four Galileo satellites for Flight VA240 are prepared for their fit-check with the mission’s payload dispenser (left). At right, one of the spacecraft undergoes the fit-check process. 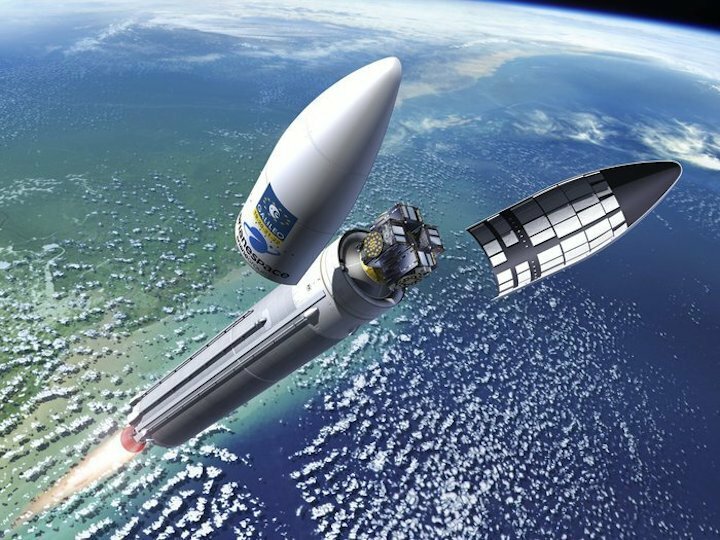 Tuesday saw Galileo satellites 19–22 declared ready for flight, along with their Ariane. Combined activities are now under way, culminating in the satellites meeting their rocket in the Final Assembly Building. 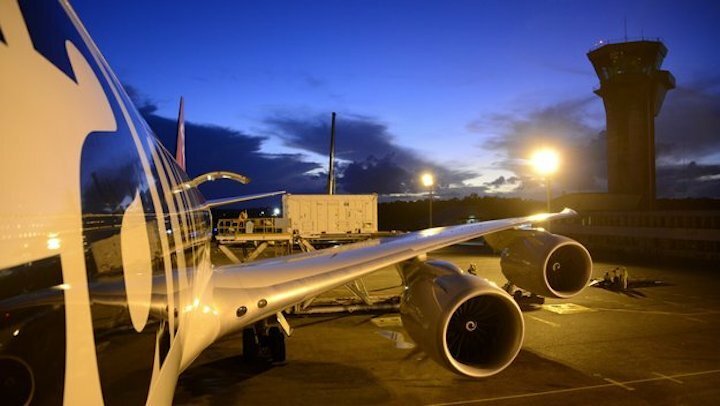 The satellites were flown in pairs to French Guiana last month. 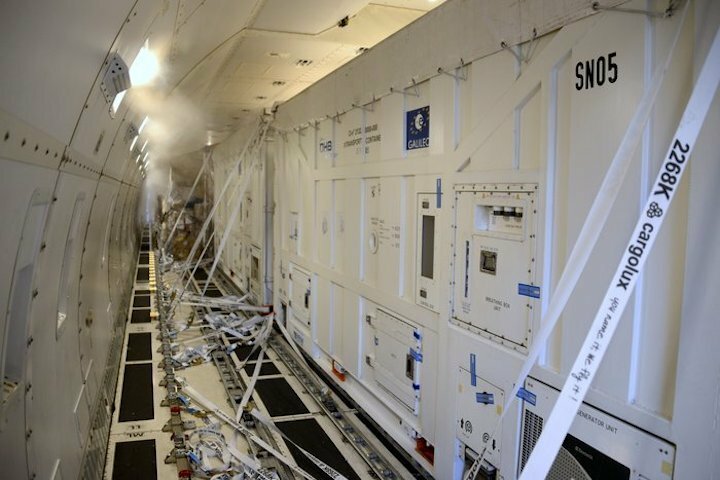 Once safely unboxed in the Spaceport’s cleanroom environment, they were tested to ensure they had suffered no damage during their transatlantic flights. Next came their ‘fit check’, when they were mechanically and electrically linked one by one to the dispenser that will carry them during their ascent to the target 23 500 km-altitude orbit, before releasing them into space. 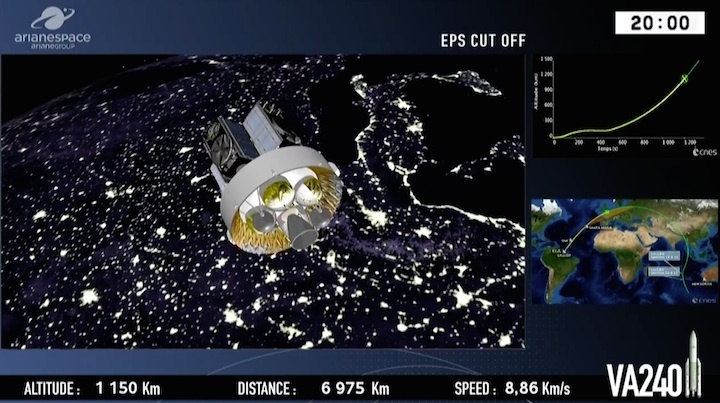 Last Friday saw the satellites filled with enough fuel to fine-tune their orbits and orientation during their projected 12 year working lives. Next, they will be attached to their dispenser together for the final time. 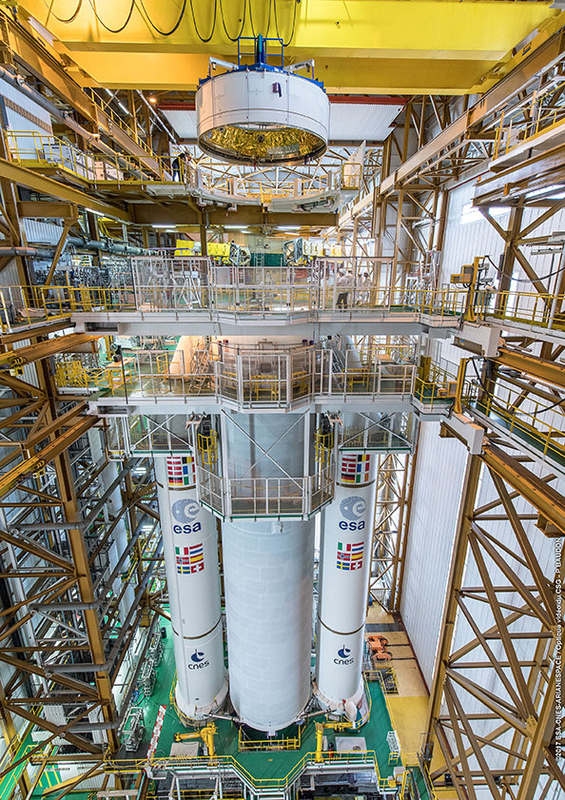 In parallel, their customised Ariane 5 is being assembled. Two solid-propellant boosters were mated with its main cryogenic stage before the addition of the interstage that carries the electronics to control the vehicle. 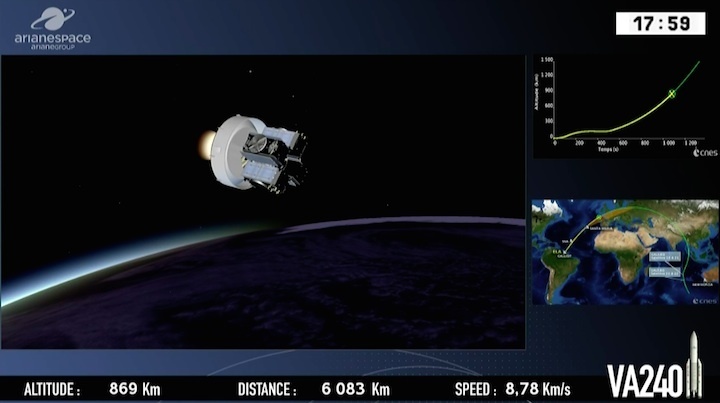 Next came the addition of the storable propellant stage, powered by a reignitable engine, which will deliver the quartet to their target orbit. 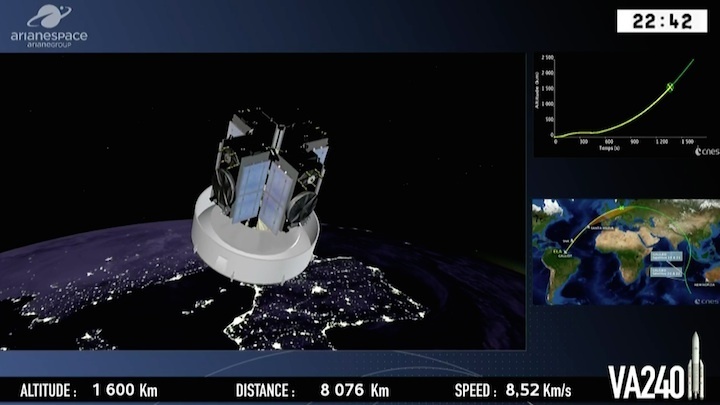 Once fully checked, the Ariane will be moved to the final building for the addition of the satellites atop their dispenser, sealed within their protective fairing. This launch will bring the total Galileo constellation to 22, boosting the global availability of navigation signals. Galileo began Initial Services just under a year ago, the first step before full operations, on 15 December. 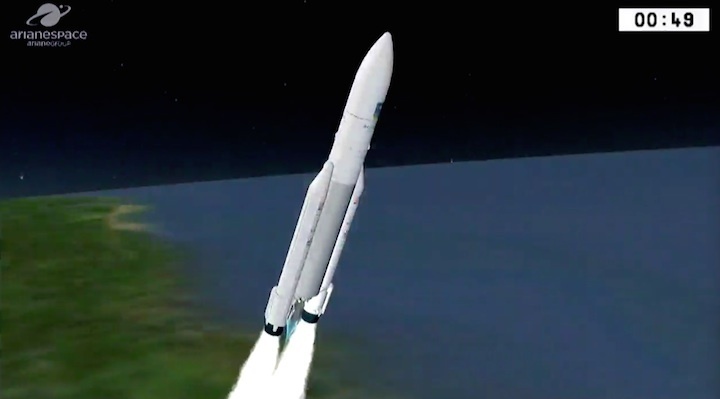 For its 11th launch of the year, and the sixth Ariane 5 liftoff from the Guiana Space Center (CSG) in French Guiana during 2017, Arianespace will orbit four more satellites for the Galileo constellation. 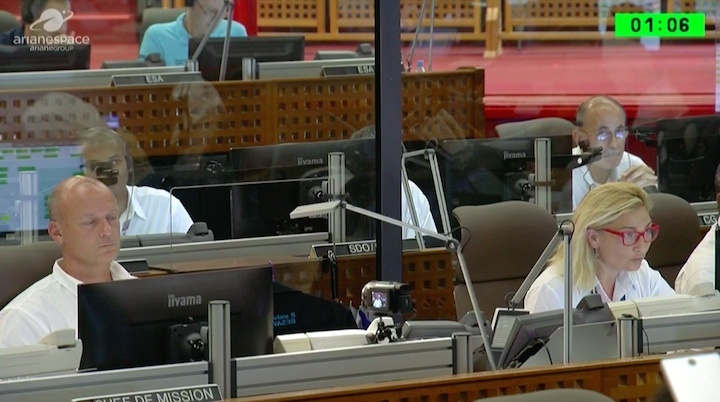 This mission is being performed on behalf of the European Commission under a contract with the European Space Agency (ESA). 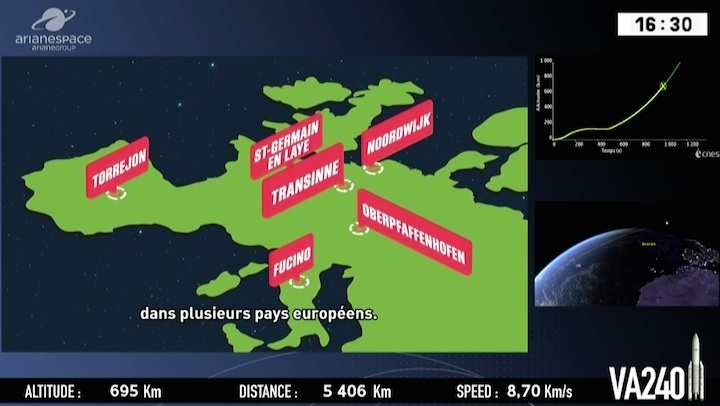 For the second time, an Ariane 5 ES version will be used to orbit satellites in Europe’s own satellite navigation system. 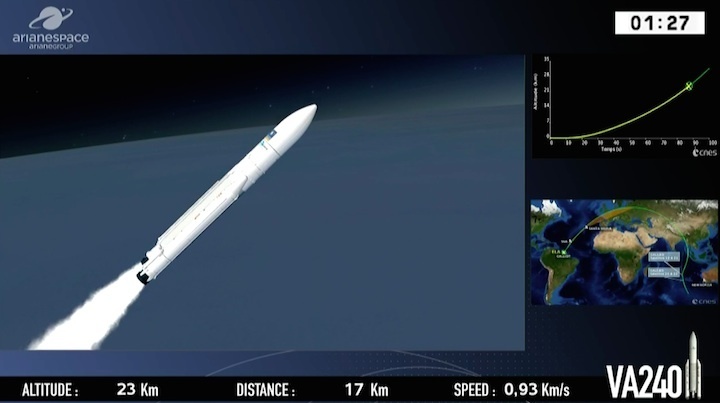 At the completion of this flight, designated Flight VA240 in Arianespace’s launcher family numbering system, 22 Galileo spacecraft will have been launched by Arianespace with Soyuz and Ariane 5 launchers. 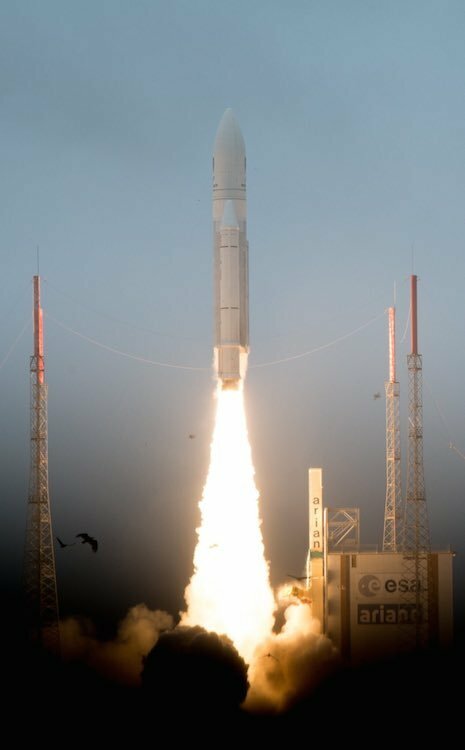 A final Ariane 5 ES mission will deploy four additional Galileo constellation satellites in 2018, after which Ariane 6 takes over from 2020-2021 – with its initial two Galileo launches contracted by ESA on behalf of the European Commission in September 2017. 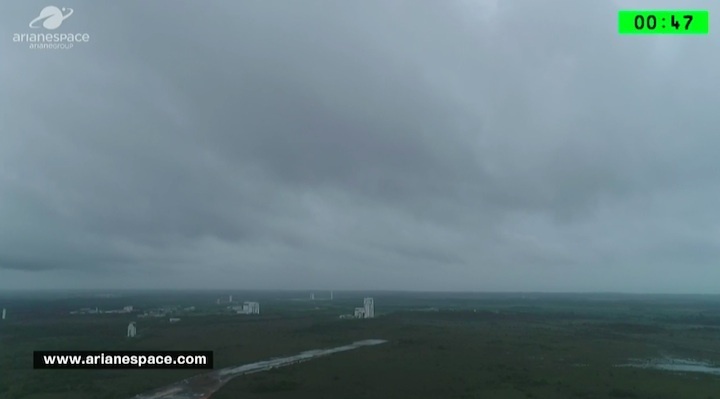 The Flight VA240 will be from Ariane Launch Complex No. 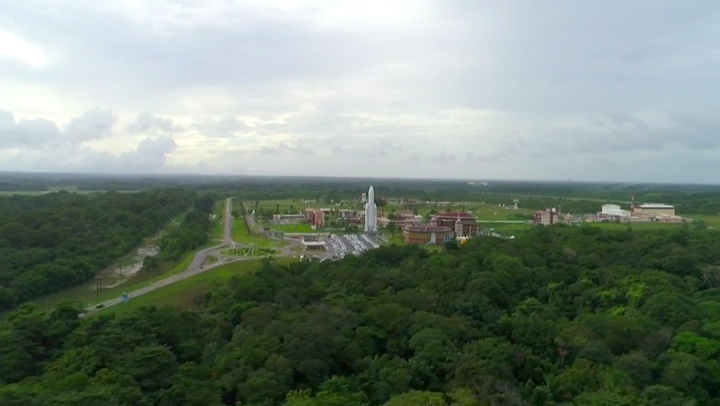 3 (ELA 3) in Kourou, French Guiana. The Launch Readiness Review (LRR) will take place on Friday, December 8, 2017 in Kourou, to authorize the start of operations for the final countdown. 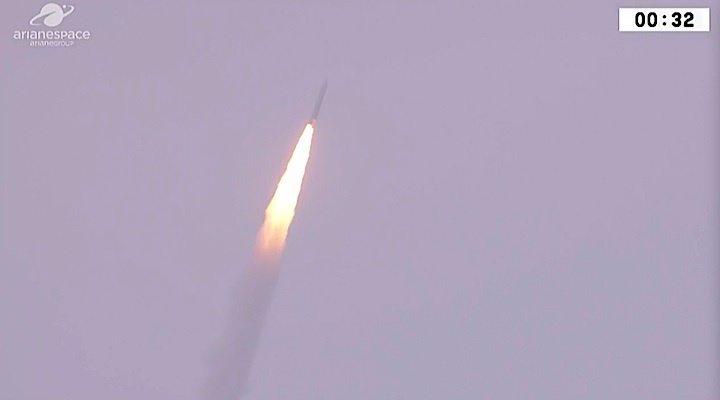 Galileo is Europe’s own global navigation satellite system. Under civilian control, Galileo offers guaranteed high-precision positioning around the world. 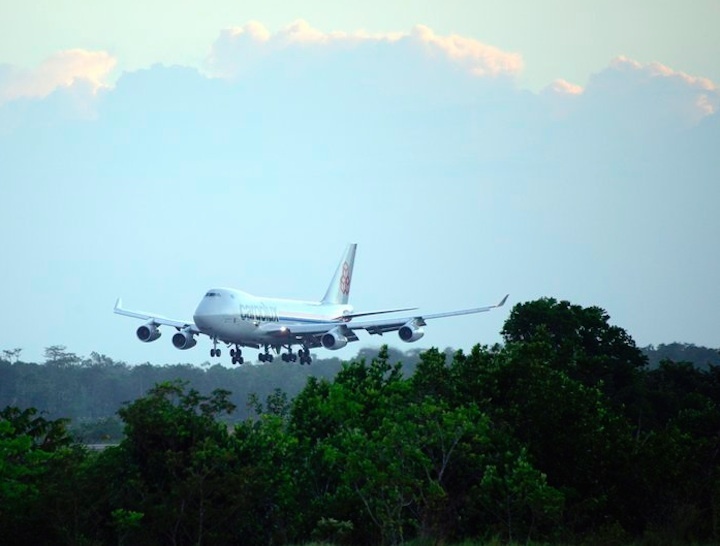 Its initial services began in December 2016, allowing users equipped with Galileo-enabled devices to combine Galileo and GPS data for better positioning accuracy. The complete Galileo constellation will comprise a total of 24 operational satellites (along with spares); 18 of these satellites already have been orbited by Arianespace. 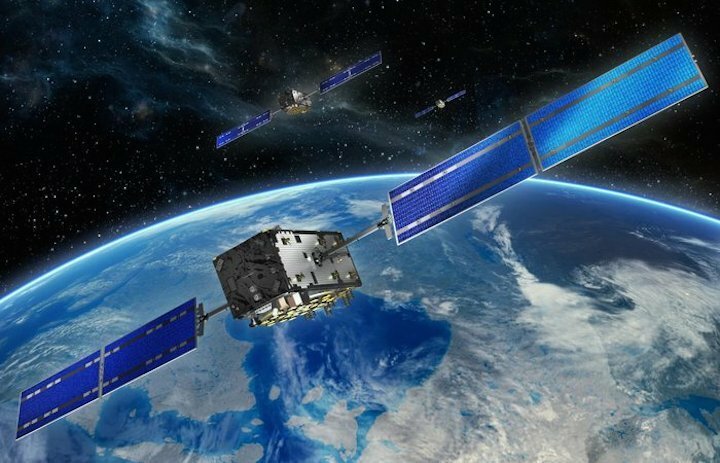 ESA transferred formal responsibility for oversight of Galileo in-orbit operations to the GSA (European GNSS Agency) in July 2017. 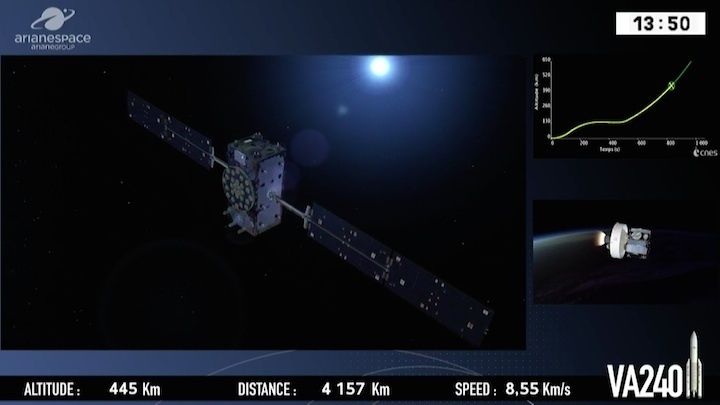 Therefore, as of this launch, the GSA will be in charge of the operation of the Galileo satellite navigation systems on behalf of the European Union. GSA will be responsible for operating these satellites as soon as they separate from the launcher. Satellite positioning operations and system operation will be carried out in conjunction with ESA. 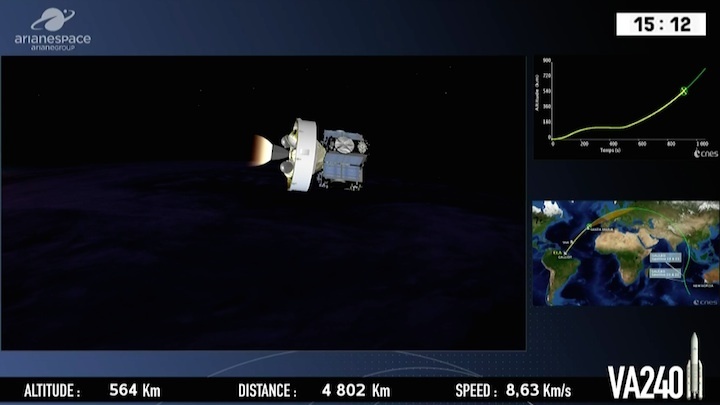 For the second time, an Ariane 5 ES version will be used to orbit satellites in Europe’s own satellite navigation system. 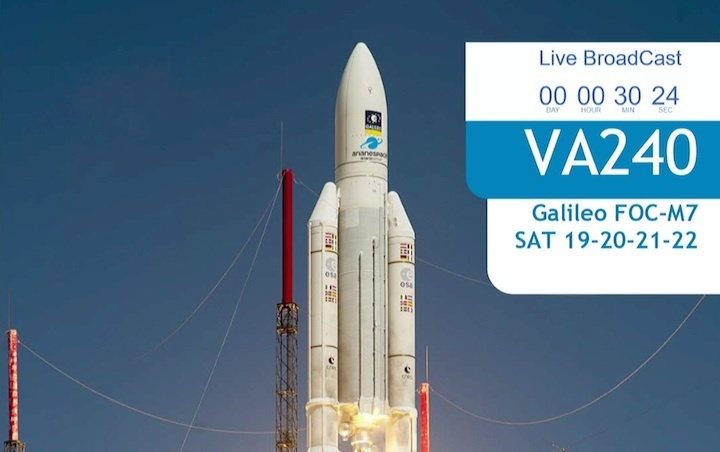 At the completion of this flight, designated Flight VA240 in Arianespace’s launcher family numbering system, 22 Galileo spacecraft will have been launched by Arianespace. 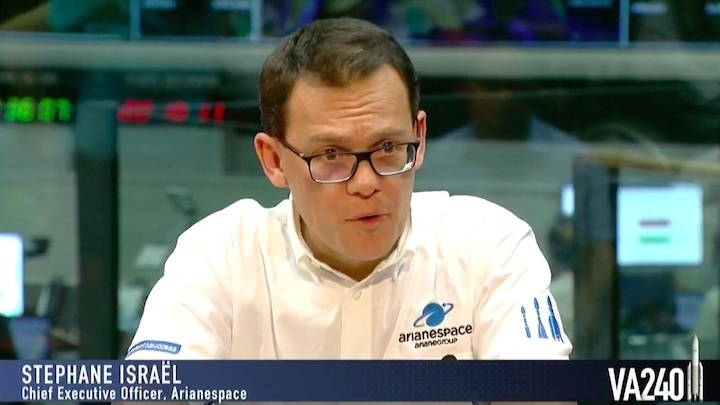 Arianespace is proud to deploy its entire family of launch vehicles to address Europe’s needs and guarantee its independent access to space. 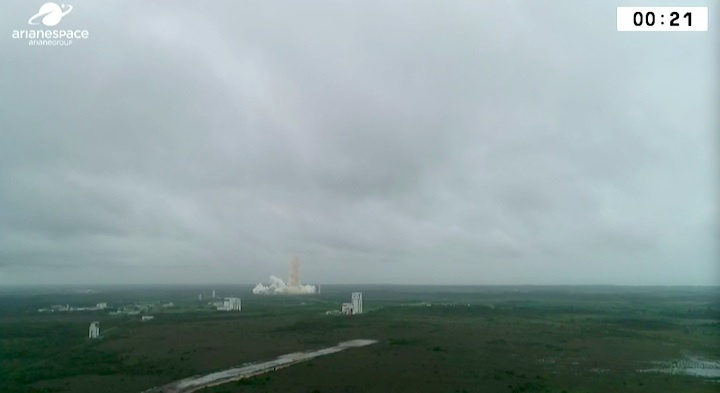 Liftoff from Europe’s Spaceport in Kourou, French Guiana is scheduled for 18:36 UTC (19:36 CET, 15:36 local time), carrying Galileo satellites 19–22. Separation of the upper stage will occur about nine minutes after liftoff, followed by the first firing of the upper stage. 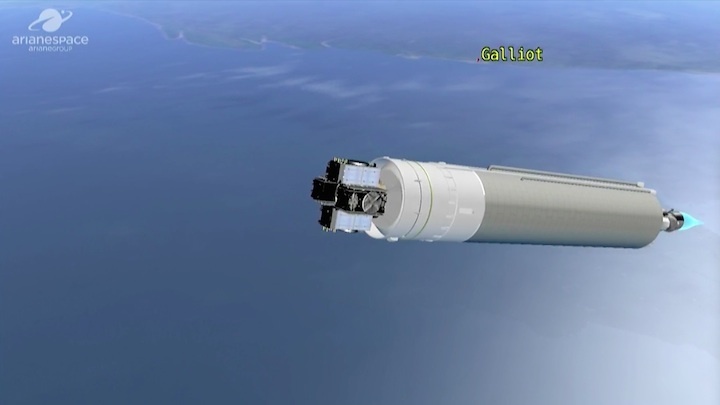 The upper stage – carrying four 715-kg Galileo satellites – will fly in ballistic configuration for three hours and eight minutes, after which a second upper stage firing will place it into circular separation orbit. The first Livestream transmission is scheduled for 18:10 GMT (19:10 CET), covering the liftoff, ascent and first phases of flight. A follow-up Livestream transmission will take place at 22:00 GMT (23:00 CET), to cover the satellite separations and confirmation of success. 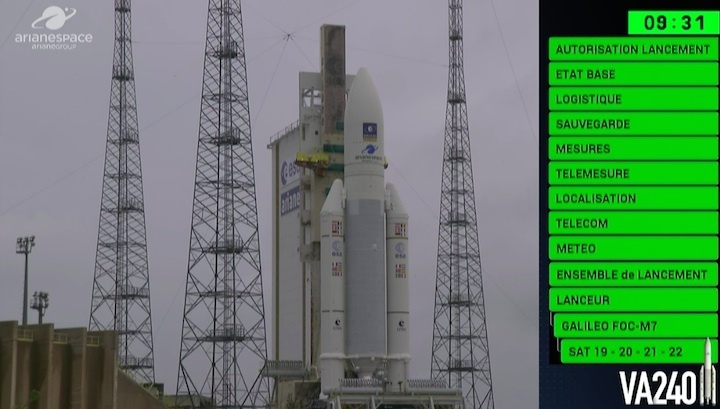 Arianespace’s Ariane 5 for Flight VA240 nears the completion of its rollout to the Spaceport’s ELA-3 launch zone for tomorrow’s afternoon liftoff with four Galileo satellites. 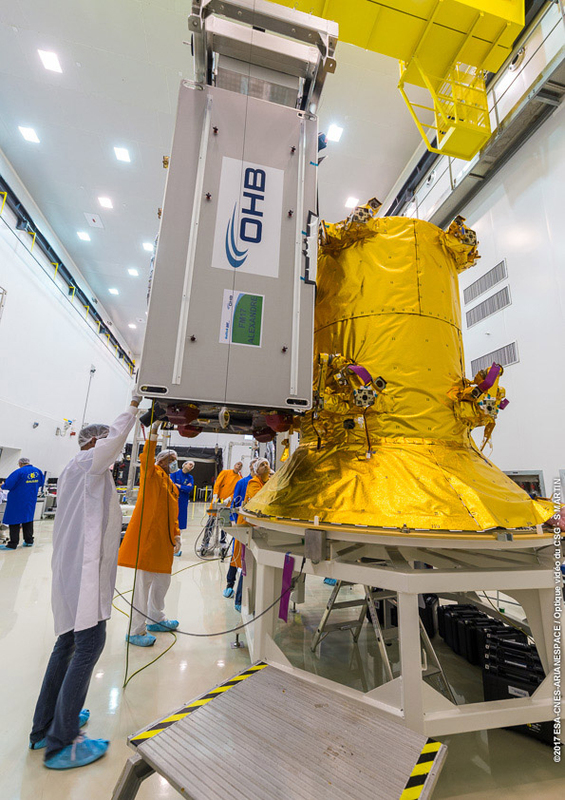 The next four spacecraft to join Europe’s Galileo satellite navigation system are one step closer to launch following the rollout of their Ariane 5 at the Spaceport in French Guiana. 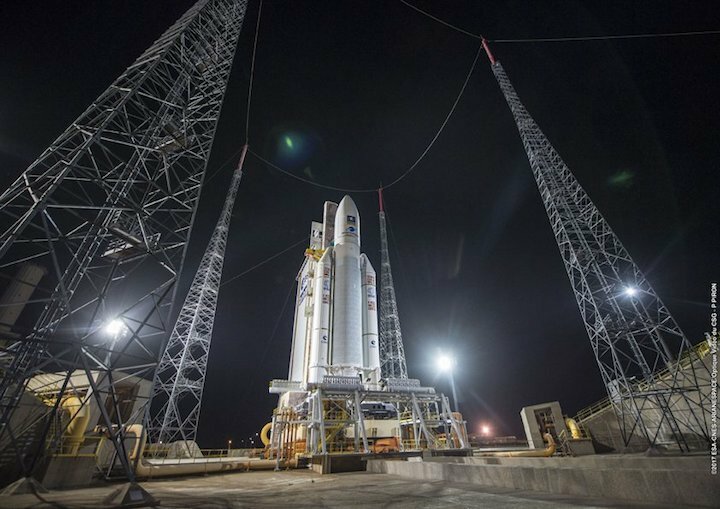 With today’s transfer from the Spaceport’s Final Assembly Building to the ELA-3 launch zone, Arianespace’s year-ending mission of 2017 can now enter its final countdown for liftoff tomorrow afternoon. 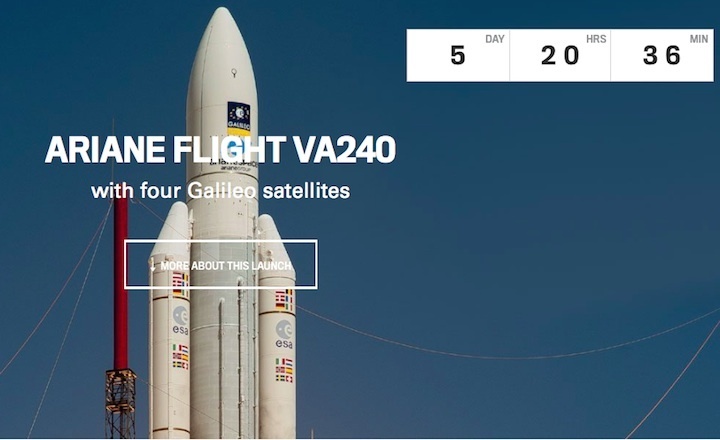 Designated Flight VA240 in Arianespace’s launcher family numbering system, the December 12 launch will deploy its Galileo spacecraft cluster into medium Earth orbit (MEO) at the completion of a mission lasting 3 hours, 55 minutes. 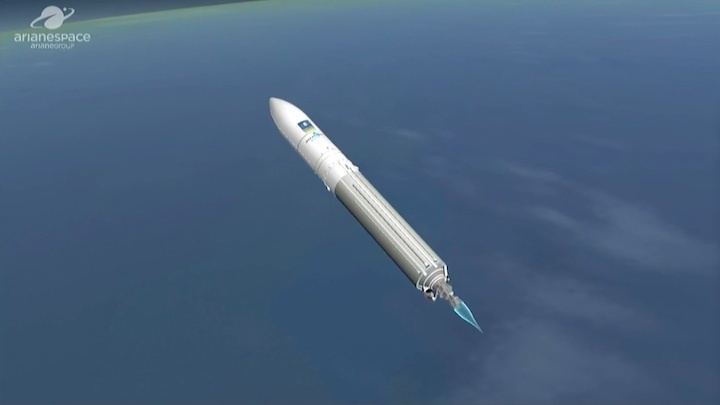 During the trajectory, Ariane 5’s storable propellant upper stage will perform two burns, which are to be separated by a 3-hour, 8-minute ballistic phase. 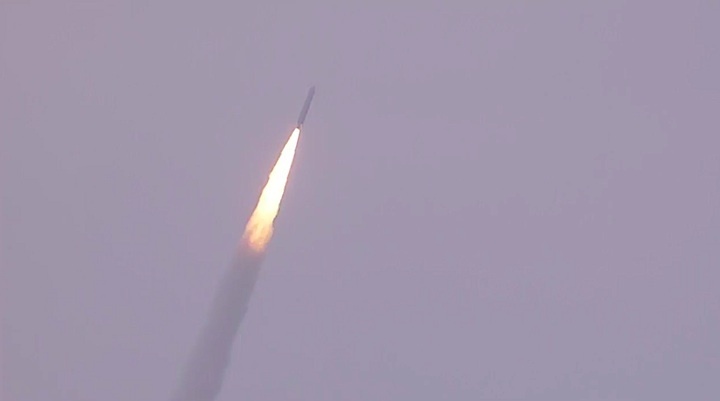 The satellites have a liftoff mass of approximately 715 kg. 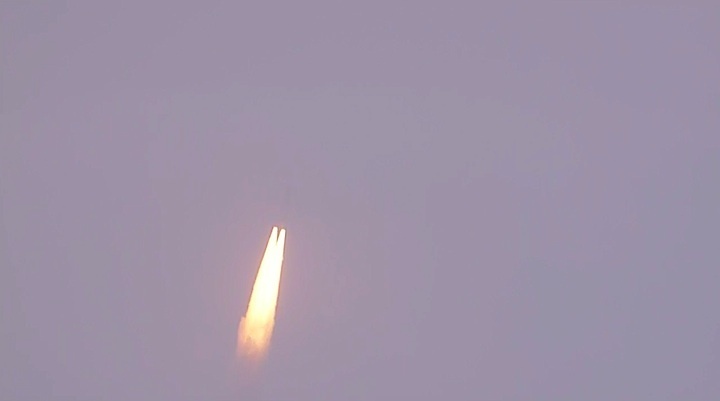 each, with Ariane 5’s overall payload lift performance on Flight VA240 set at 3,282 kg. 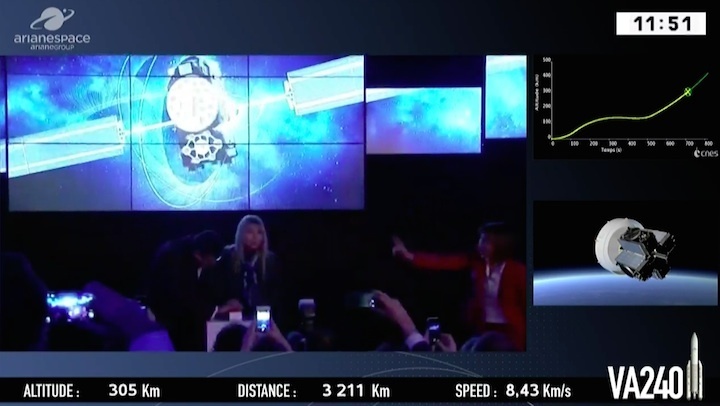 “Today’s launch is another great achievement, taking us within one step of completing the constellation,” remarked Jan Wörner, ESA’s Director General. 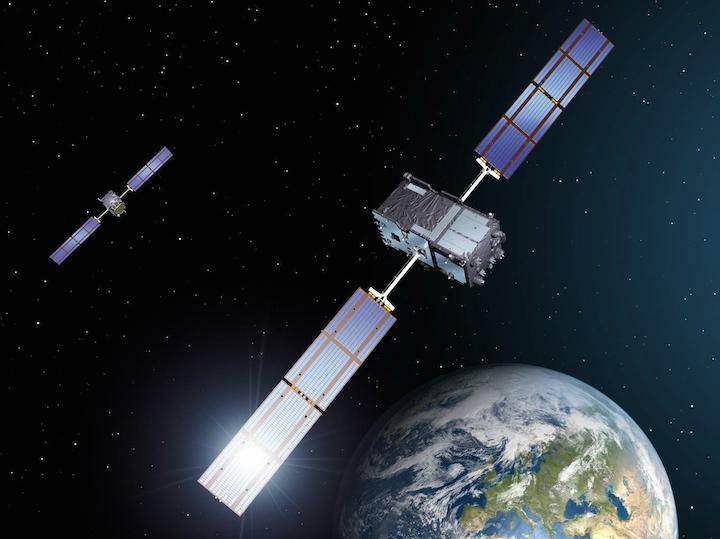 Galileo is Europe’s civil global satellite navigation system. It will allow users worldwide to know their exact position in time and space with great precision and reliability. Once complete, the system will consist of 24 operational satellites and the ground infrastructure for the provision of positioning, navigation and timing services. 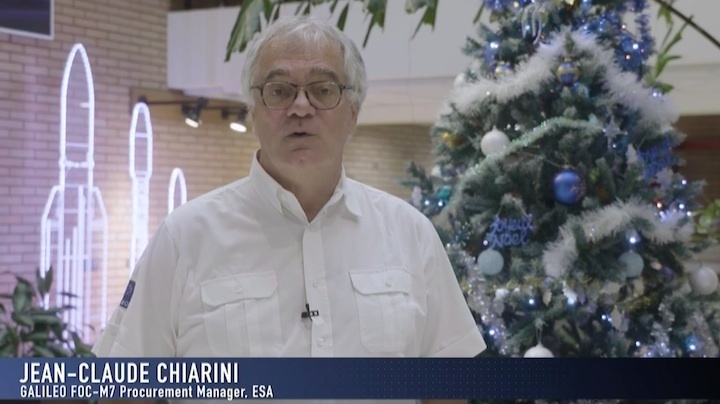 Galileo’s deployment, the design and development of the new generation of systems and the technical development of infrastructure are entrusted to ESA. The definition, development and in-orbit validation phases were carried out by ESA, and co‑funded by ESA and the European Commission.